A couple months ago a friend of mine asked if I would help her add some small decor to her house. I've loved home design since I can remember, so of course said yes! 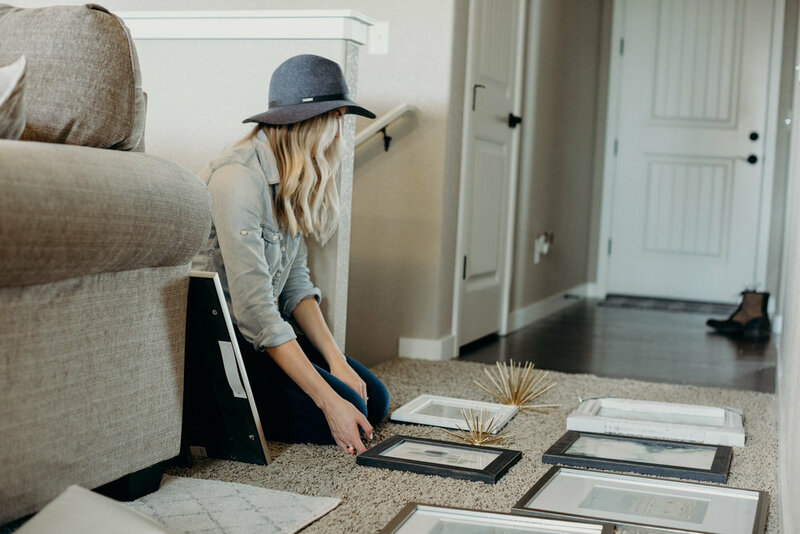 She wasn't looking for much help, their home was already so beautiful, she just needed some help adding little touches of character here & there along with a Gallery wall. I loved the project and learning more about Kaitlyn's chic style! We added some decorative shelves, a gallery wall, and fun pops of gold throughout the living room. My favorite piece of our project were the "naked books." In order to add some texture & height to her floating shelves, I used hardcover books from a thrift store (one of them was "Happy, Happy, Happy: My Life and Legacy as the Duck Commander" for $2), thew away the covers, and turned the books around! It's a great (and affordable!) way to easily add a nice pop to any shelves. If you, or anyone you know, is looking for a little help with interior design send them my way! *All photos taken by Clancey James Creative.